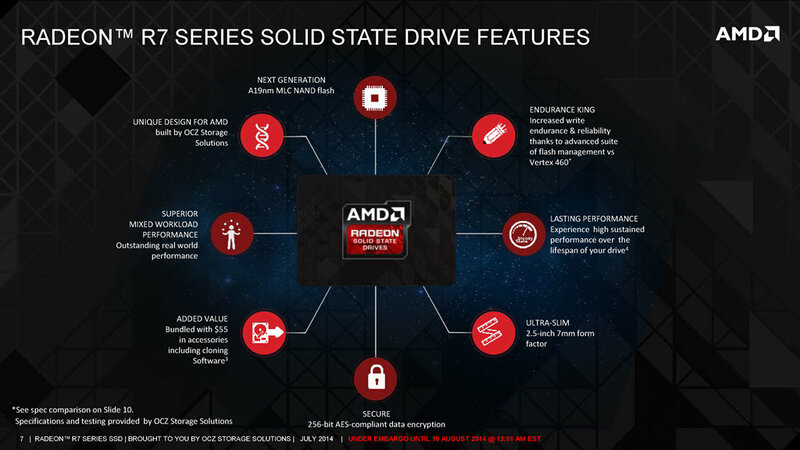 I previously published an article regarding AMD’s first and upcoming Solid State Drive, the AMD Radeon R7 SSD Series. 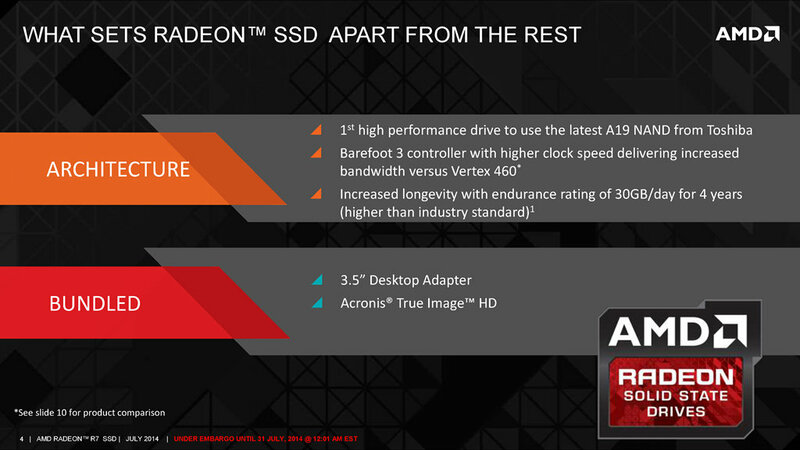 And recently, AMD has officially announced and introduced their new SSD lineup. 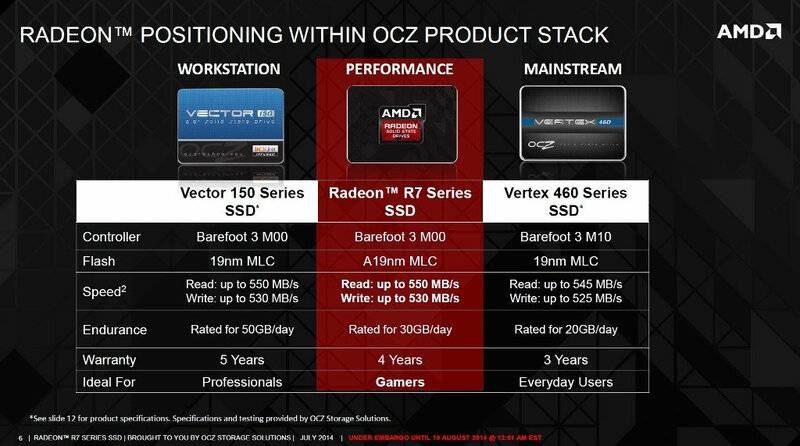 AMD’s SSDs are built by OCZ and were rebranded as the Radeon R7 with a slight modification targeting PC gamers. It is most likely a rebrand of OCZ’s recently released ARC 100 series. The Radeon R7 Series SSD features Barefoot 3 M00 Controller, A19nm MLC Flash, has read/write speeds of up to 550 MB/s and 530 MB/s respectively, rated for 30GB/day endurance and come with a 4 year warranty. Check out more of its features, specifications, as well as its price below. 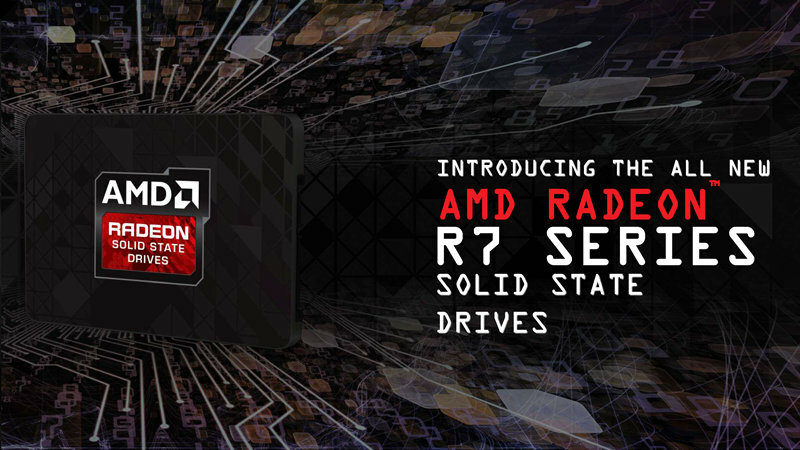 The AMD Radeon R7 Series SSDs are an excellent choice for gamers looking to upgrade their system’s overall responsiveness with an economical solution that puts performance and reliability front and center. 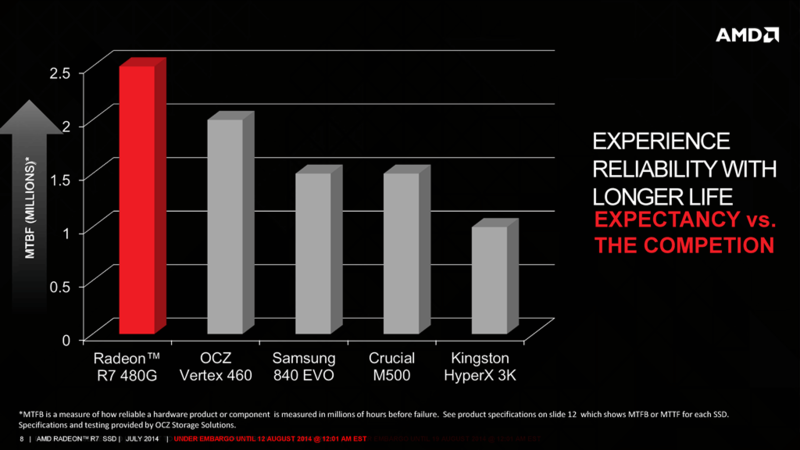 AMD Radeon R7 Series SSDs are a unique solution in the OCZ Storage Solutions portfolio. 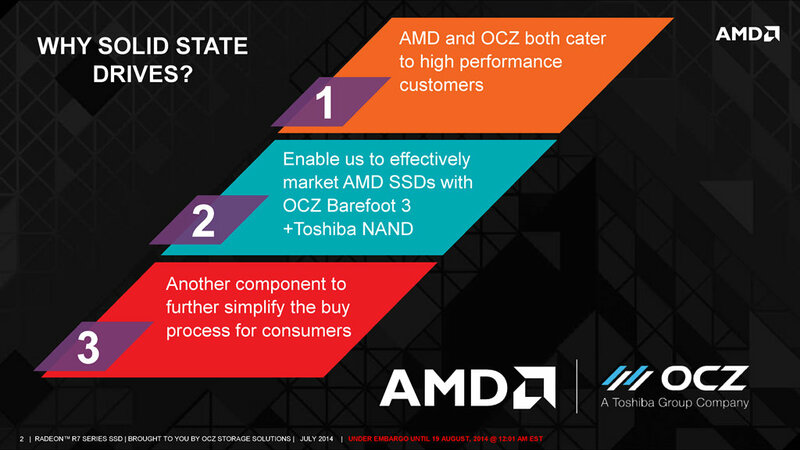 As the first high performance SSDs to utilize the Toshiba Group’s latest A19 MLC NAND flash process and the proven Barefoot 3 M00 controller, the AMD Radeon R7 Series disks offer exemplary write endurance of 30GB/day, as well as read/write speeds of up to 550MB/s and 530MB/s, respectively. This exclusive combination of hardware also features a special anodized black housing, characteristic of the AMD Radeon brand. AMD Radeon R7 Series SSDs represent the next stage of AMD’s strategy to be a “one-stop shop” for consumers, with a portfolio of high-performance solutions that now includes: AMD Radeon™ graphics cards, AMD FX processors, AMD Accelerated Processing Units, AMD Radeon memory, processor chipsets, and more. The addition of a solid state drive makes it easier than ever for a customer to outfit their system with like-branded components both for peace of mind and reliability. 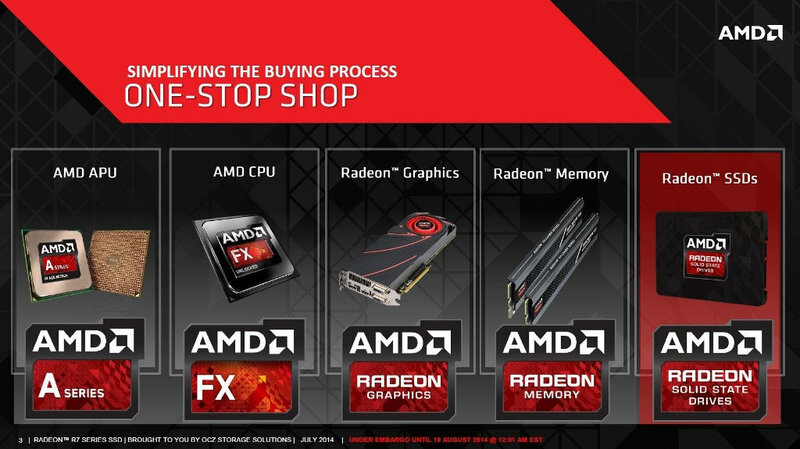 AMD Radeon R7 Series SSD is available in three capacities, the Radeon R7 120G, Radeon R7 240G and Radeon R7 480G. 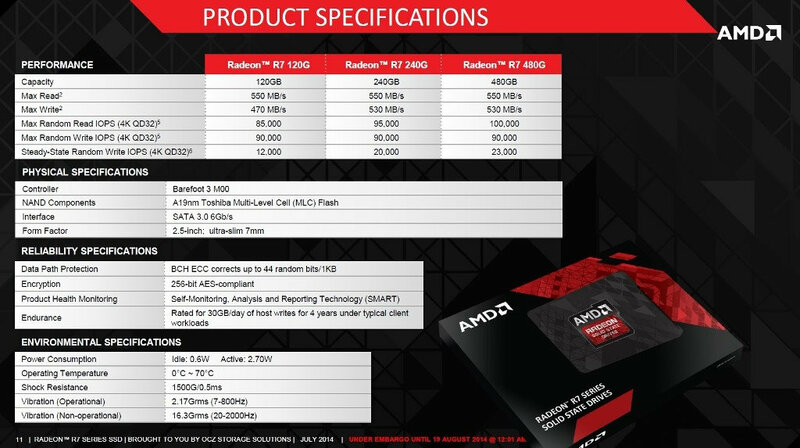 The Radeon R7 SSDs will be available with a suggested retail price starting at $99.99 for the 120GB capacity, followed by $163.99 for the 240GB, and $298.99 for the 480GB. I’ll try to post an update later when it becomes available to order on popular online stores like Amazon.